The Papaya/பப்பாளி பழம் is a tropical fruit, rich in nutrients and loaded with antioxidants. Papaya is orange colored juicy fruit, which is not only fragrant but also extremely delicious and tasty, so Christopher Columbus reportedly called it “Fruit of Angels”. Papaya has numerous health benefits which includes better digestion, stronger immunity, regulated menstruation, relief from toothache, weight loss, skin care, better heart health etc. Researchers have discovered that papayas are effective against breast, pancreatic and other cancers. The latex obtained from papayas is used to treat the areas of the skin affected by acne. This fruit is not just healthy but tasty and versatile. We can make several recipes with raw papaya and ripe fruit can be had in different ways which I will be sharing in my upcoming posts. As Papaya is tropical fruit it grows abundantly in Chennai. 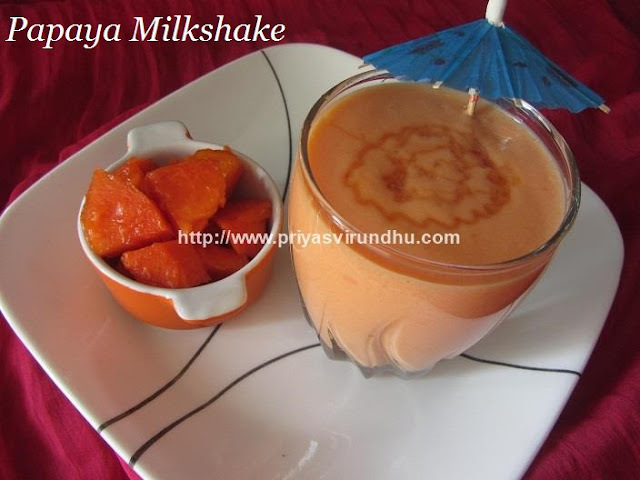 We have couple of papaya trees in our backyard which does not need any special care and it started to bear some fruits, so here I am sharing a very delightful, exotic and healthy Papaya Milkshake. Meanwhile check out other interesting, Smoothies, Milkshakes, Juices, lassies and Ice creams Recipes here. 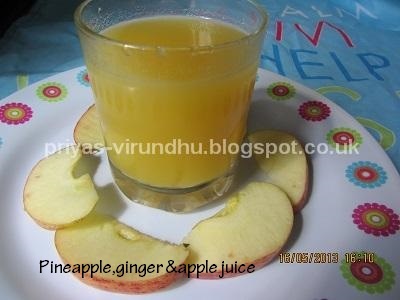 Today I am going to share, one of the best home remedies for cold and cough it is none other than – மிளகு மஞ்சள் பால் /Milagu Manjal Paal. When we were kids, my mom used to make this wonderful milk during the onset of winter seasons and also especially when we suffer from cold, cough and sore throat. It is very easy and simple to make but has numerous amount medicinal benefits. 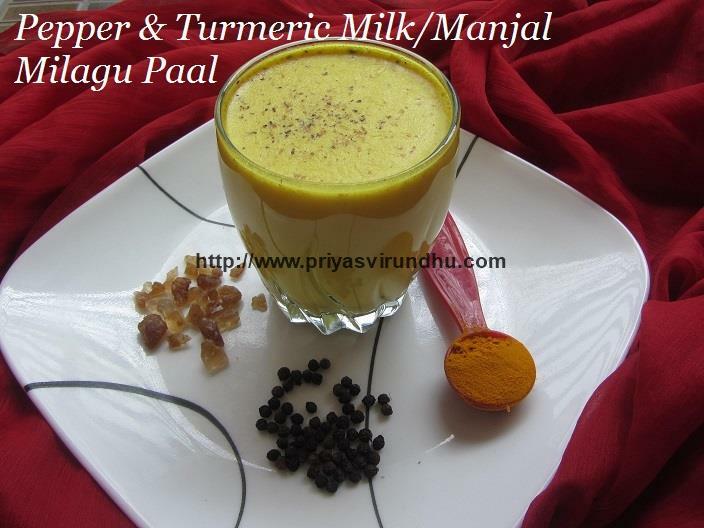 This milagu manjal paal, can be had after dinner it helps in clearing the phlegm, soothes the throat irritation and helps you to doze off. This is one healthy drink which you should never miss, because it helps to build the immune system and fights the infection. Make you magic golden milk and fight off your cold and sore throat, drink healthy and stay healthy. Today, I am going to share a exotic recipe made by my daughter from her favourite Elmo’s recipe book – Hot Cocoa Float. This hot cocoa is enriched with real milk chocolate and a scoop of ice-cream topping, so a little goes a long way to satisfy a sweet tooth. You can save this dessert-like drink for special occasions, but hot chocolate without topping is tasty and comforting anytime. 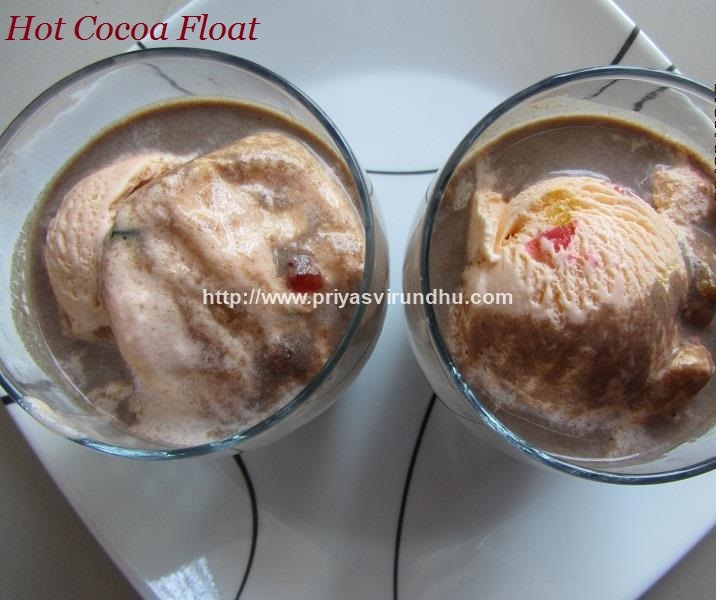 Do try out this Hot Cocoa Float and post your comments here. Meanwhile do check out other milkshakes, ice-creams and other interesting refreshing drinks here. Today, I am going to share a very interesting recipe which will surely bring back childhood memories. 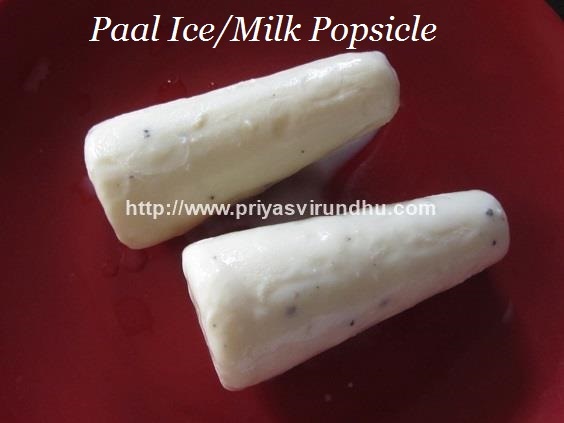 Paal ice/Milk kulfi is always a favorite among all the age groups. I remember my childhood days enjoying the paal ice with friends from street vendors. 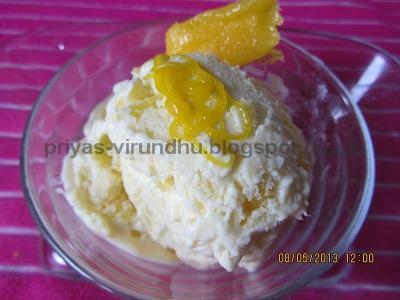 I have posted mango kulfi earlier, do try out this Paal Ice and post your comments here. Meanwhile do checkout other ice creams and milkshakeshere. Jigarthanda is the most popular drink which originated in the South Indian city of Madurai in Tamil Nadu. Jigarthanda is a unique milk based drink, with two main ingredients Badam Pisin and Nannari Syrup[Indian Sarsaparilla] which has a cooling effect on the system. Badam Pisin is an edible gum collected from badam/almond trees. Badam tree bark secretes the gum and it gets dried up, which is later collected and used for medicinal purposes/ They look like little rocks which are white in color and an excellent natural body coolant. Badam Pisin is a natural jelly which can be consumed by everyone to beat the heat. 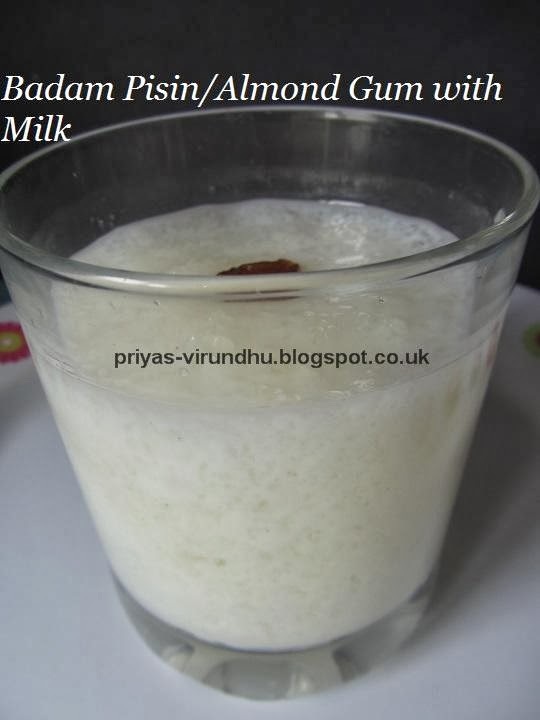 Also check out how to make Badam Pisin Milk in the link and enjoy. 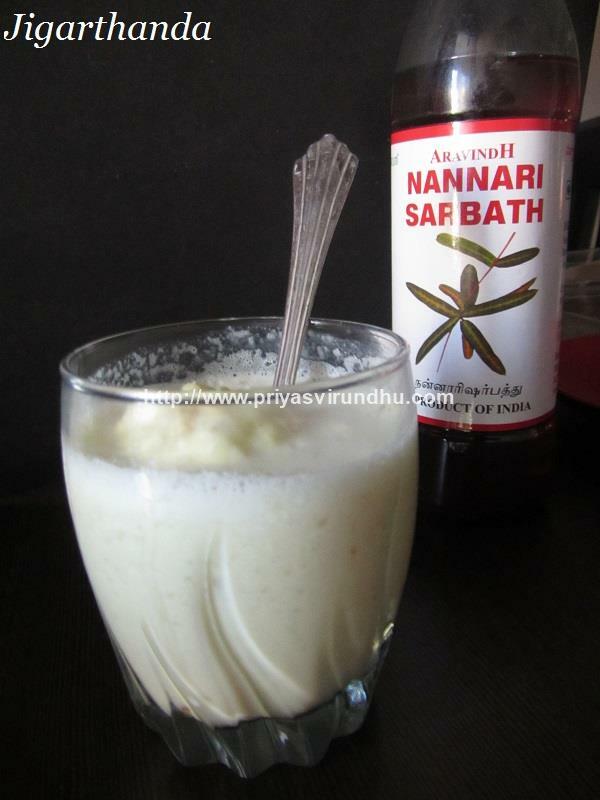 Nannari Syrup prepared from Nannari roots has numerous health benefits. It is an excellent natural body coolant, when had in the form of sharbets will keep us hydrated. It is an excellent blood purifier and a wonderful health tonic. Nannari syrup is an effective home remedy for stomach disorders, indigestion and relieves body pain. 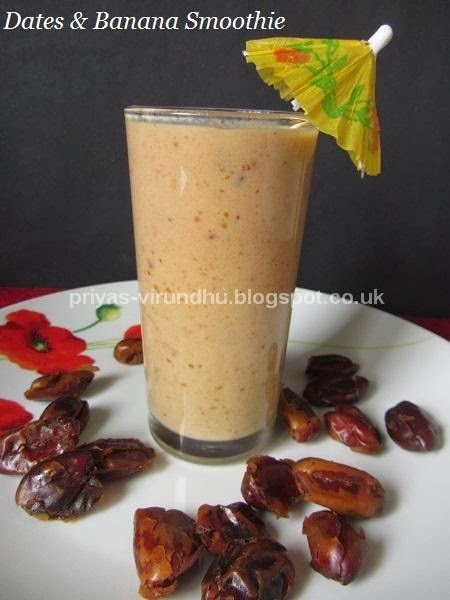 Jigarthanda drink has one other important key ingredient it is none other than the ice cream, you can either prepare ice cream at home or use a store bought one. 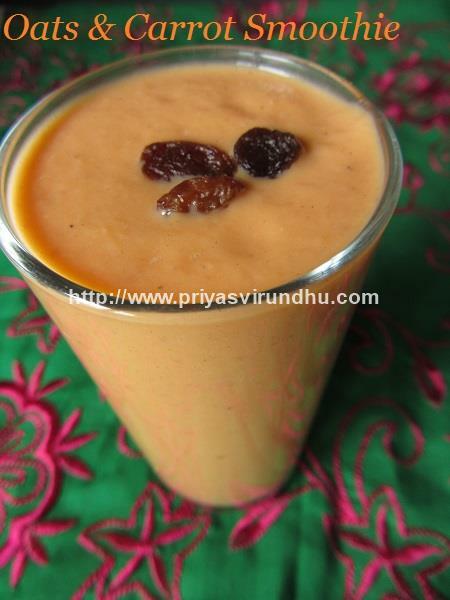 I will very soon post the homemade ice cream for jigarthanda in my coming posts. For now friends do try out this extra cooling and tempting Jigarthanda and have a lovely day. Do check out other lovely milkshakes, ice creams, beverages etc in the link and post your comments here. 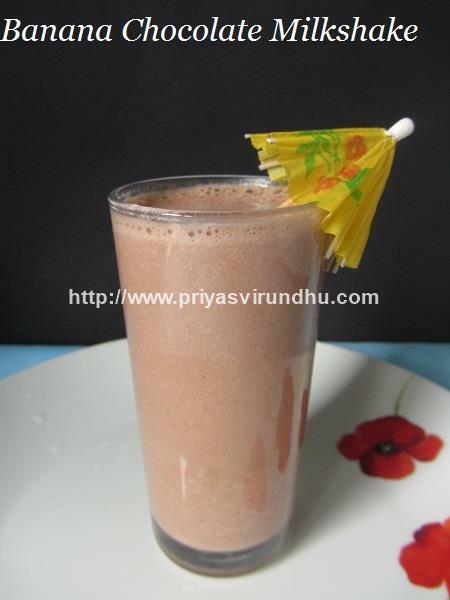 Today I am going to share a very simple and quick Banana Chocolate Milkshake. You can make it no time and surprise your kids after school. I have added a scoop of ice cream, you can make this milkshake fat free by skipping the ice cream. 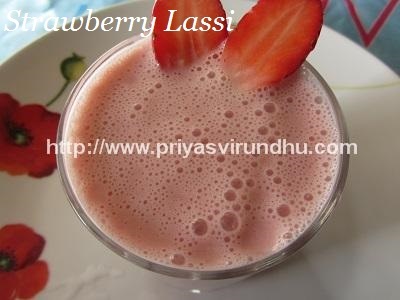 Try out this luscious milkshake and have a great day. Meanwhile check out other milkshakes & smoothies here. Today I am going to share with you all a very light, healthy and filling breakfast smoothie. You can make this smoothie is no time and it can also be served as snack between meals. The carrots offers vitamin A & C, dates offer iron & minerals, milk provides calcium & minerals and oats gives enough fibre and energy. So why not start your day with this healthy smoothie? As the name says it all, without any further delay I am moving on to this refreshing, cooling and addictive Mango Lassi. 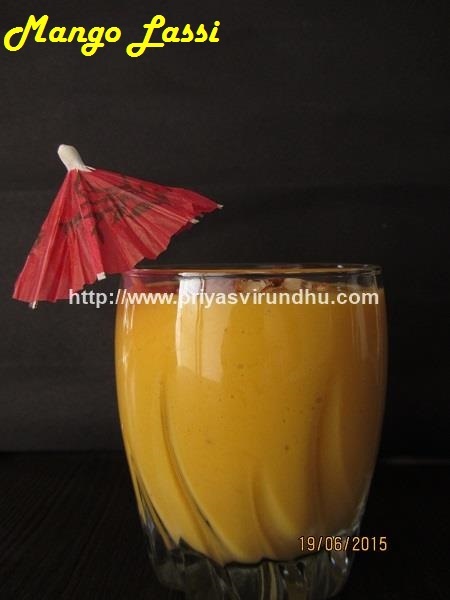 Try out this Mango Lassi and enjoy. Meanwhile do not forget to check out other Mango Recipes here. 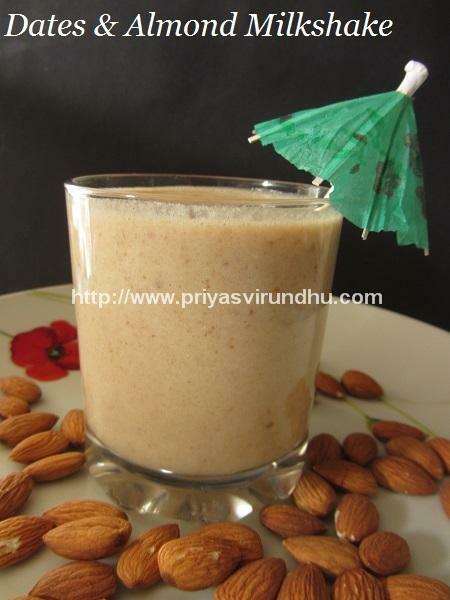 Today I am going to share a very simple, yet healthy and nutritious milkshake made with just three ingredients dates, almonds and milk. Dates are loaded with iron and potassium. They are excellent source of dietary fiber and numerous health benefits packed in them. Almonds are a great source of many nutrients which help in development and health of human brain. Almonds help in regulating cholesterol and improve the strength and durability of bones and teeth. Almonds are good for our heart as they have unsaturated fats, proteins and potassium, the vitamin E present in it reduces the risk of heart disease. Daily intake of 2 or 3 almonds strengthen our immune system and improve skin health and complexion. Milk as we all know provides calcium, phosphorous, magnesium and protein which are all essential for healthy bone growth and development. 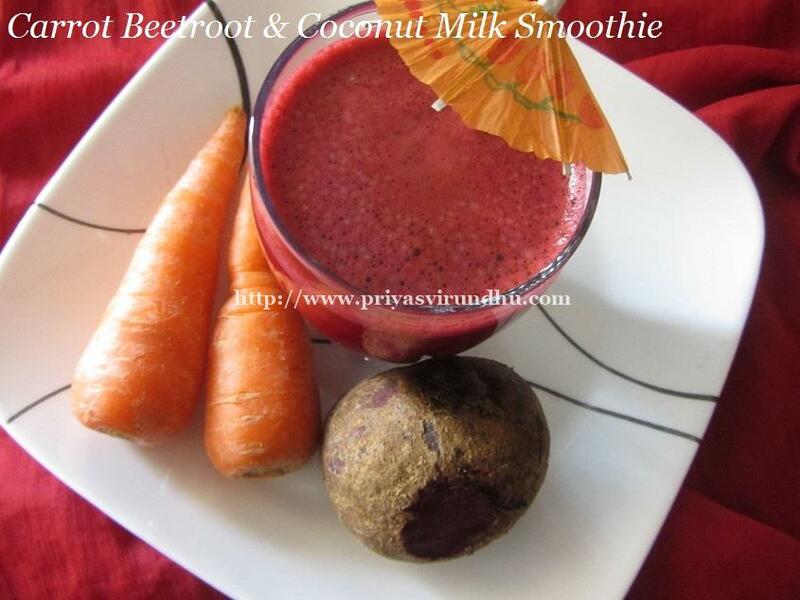 Try out this healthy milk shake and have a great day. 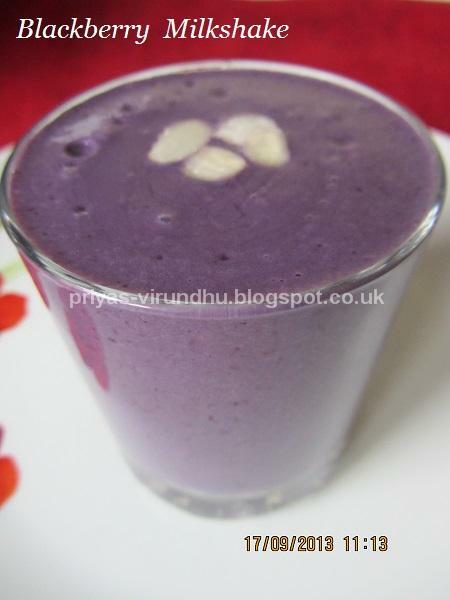 Today in Priyas Virundhu it is a simple and healthy milkshake. Do you want to start your day healthy and are you looking for quick breakfast, all you need is just a cup of milk and a carrot blended with sugar. Addition of sugar to the milkshake is optional, you can very well replace it with honey. Are you looking for a healthy and a filling breakfast? Then here it is Dates & Banana Smoothie. Just blend it in the mixer and your on-the-go breakfast is ready. Dates are good source of vitamins, minerals, fiber, sugar and energy. These essential minerals and vitamins help in strengthening the bones, curing anaemic conditions, intestinal disorders, boosts the nervous health etc. Dates along with bananas and milk make this Smoothie a super-rich and healthy breakfast. Blackberries are available from the end of July through mid of October in UK. They are very delicate, shiny and purply black coloured berry. Blackberries are packed with antioxidants including vitamin C and ellagic acid, these help in protecting against cancer and other chronic diseases. Blackberries are very good source of fibre because they have a lot of tiny seeds, every 100 gm of blackberries have 5 gm of dietary fibre. Since it was hard to get my girls to eat Blackberries I made them the milkshake which I am sharing with you all. I love to drink tea and when it comes to masala tea, I love the blend of spices infused together with the tea leaves makes me drink more and totally irresistible. Tea is drunk in all parts of India, but made differently in each place. My husband does not drink tea or coffee, I was like that until before marriage. But after marriage things changed I started to fall in love with tea and coffee. 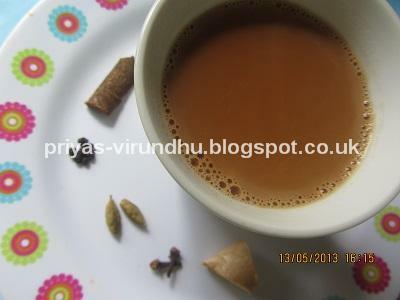 My father in law prefers to have cardamom/elachi & ginger tea but started to have this masala tea and likes it a lot. Our families evening is complete only if we all have a cup of delectable tea and have a chat. Homemade ice cream and that to mango ice cream, I don’t think nobody is going to say no to this. It is very simple, quick, easy and just made with three ingredients and off all the best part is - no ice cream machine. I came across this in savitha’s kitchen and gave it a shot. It is so creamy, delightful and the taste of mango is still lingering in my mouth.